Sparkling light that an engagement ring emits signals the arrival of marriage. If you caught up between engagement and wedding ring difference? Or which finger to wear engagement ring and wedding band? Do not worry, here we offer you a detailed information of choosing a perfect engagement ring to make your proposal foolproof. Engagement ring mostly have a bid stone or diamond, most people like to use this ring to marry, but does not always wear it after marriage. The wedding ring style is relatively common, does not require a big diamond, its simple & classic style but yet shows a symbol of eternal love. On which finger to wear engagement ring? After solving issue of buying a suitable engagement ring, next step is to know on which finger to wear engagement ring? Wearing a ring also symbolizes love, so the engagement ring must be worn on a specific finger. Engagement ring should be worn on the left hand’s middle finger, wedding ring should be worn on the left hand ring finger. Which type of stone is best for engagement ring? Generally an engagement ring has a diamond, that symbolize endurance, but you have to take an account of nature of your partner and his/hers preferences, you can also send a ruby ​​ring, a symbol of passion; or sapphire ring symbolizes depth; or a green gemstone, a symbol of wealth and pure image. Pearl symbolize elegance. – It should be valuable, elegant and comfortable to wear. – An engagement ring is generally a gold ring with a diamond mounted on it. If budget doesn’t allow then best choice is sterling silver, platinum or titanium ring, so that the ring is relatively inexpensive but yet decent. – To give a more personal touch to ring, it can be customized with laser engraving, names, dates, love quotes or heart symbols can make ring memorable. 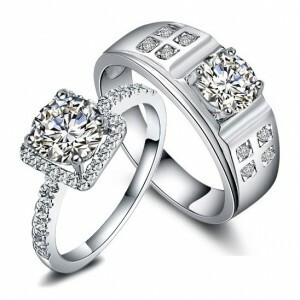 Check out custom engraved low budget rings set for couples.